On the way to a briefing, Artoo overhears a call for help and follows it into one of the base's many tunnels, an action spotted by one of the Hoojibs. At the briefing, Leia announces that the Rebels have learned one of three bounty hunters worked with Boba Fett to capture Han Solo, and then was cut out of the deal by Fett, so the Alliance intends to find all three in the hopes they'll turn on Fett. As the Rebels prepare to depart, the Hoojibs tell Threepio about Artoo's absence, leading he & Chewbacca to journey deep inside the base. 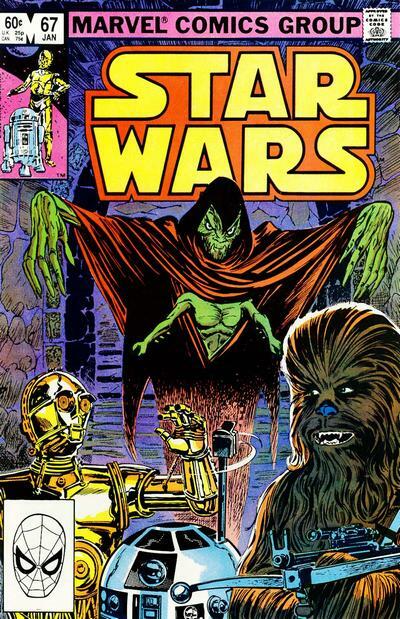 They eventually discover a massive ancient city protected by a force barrier, and inside, a damaged Artoo along with a creature called the Darker, who claims to be the dark energy of the original Arbrans taken physical form. Able to control emotions, he fills the Hoojibs with fear and turns Chewbacca's devotion to his friends into rage, setting him after Threepio. Stumbling across a library, Threepio learns that the Darker can be dispersed by coming into contact with the energy field surrounding the city. After Threepio breaks the Darker's control by calling on Chewbacca's affection for Han, Chewbacca throws the creature into the field, destroying him. Returning to the surface, they are greeted by a Rebel pilot who tells them Luke is looking for them, and to get ready to depart: their "vacation" is over. This issue kicks off the "Search for Han Solo" story arc, a long overdue storyline which finally features Luke, Leia, Lando, etc. making a concerted effort into finding and rescuing the carbonite-encased Han, a storyline which will also reintroduce a handful of the bounty hunters introduced in Empire Strikes Back to the series to serve as antagonists, and one which will mostly carry the series through to Return of the Jedi (at least, to the release of the movie and the first issue of the separate limited series adapting it; it will take a few more issues after that for this series to reflect the continuity changes made by the film). Ron Frenz does layouts for this issue, and though he won't contribute to the next three issues, he'll return with issue #71 and serve as the book's new regular artist through issue #82. 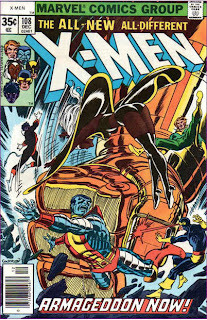 He will later develop more of a retro, Kirby-pastiche style, and is probably best known for his runs on Amazing Spider-Man, Thor and Spider-Girl (all with writer and feature Editor-in-Chief Tom DeFalco), though here Tom Palmer remains as inker/finisher, maintaining a visual consistency for the series that keeps it from looking all that different to how it did under Walt Simonson's pencils. 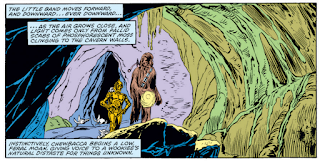 For the first (and possibly only) time, this issue provides internal narration for Artoo, as he hears a call for help and weighs his options. It's remarkably in-character for a character we've never heard "speak" before. 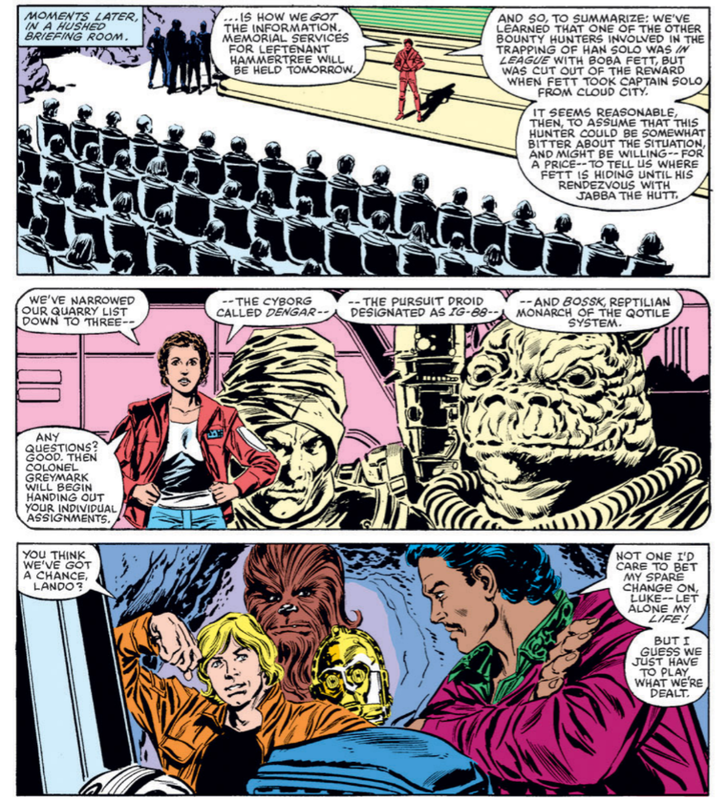 A narrative caption in this issue declares that Wookiees have a famous distaste for the unknown. 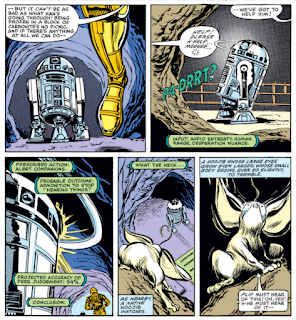 The question of just how sentient the droids in the Star Wars universe are (and ensuing questions, such as whether or not a droid could use or be sensed in the Force) have been long-discussed amongst friends; this issue adds a log to that fire by making it clear that the telepathic Hoojibs are capable of communicating with Threepio without issue. During her briefing, Leia says that Bossk is the ruler of the world Qotile; later continuity will establish that Bossk is simply a bounty hunter from the planet Trandosha, though his father was, for a time, the leader of the Bounty Hunters Guild. During the briefing scene, "Hutt" is spelled correctly (with two "t"s) for the first time in the series. 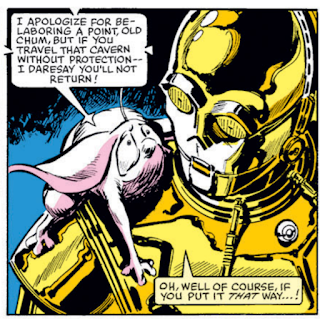 Pliff uses the phrase "old chum" to describe Threepio. Anyone reading this series with even the vaguest knowledge of how licensed stories work, either now, when it was originally published, or any time in between, knows that any effort the Rebels make to rescue and revive Han Solo is going to fail: it doesn't take hindsight to know Han's fate will be revealed in Return of the Jedi, not the tie-in comic book. But that doesn't mean the series shouldn't show the Rebels trying, because the characters don't know they'll have to wait for their further cinematic - rather than comic book - adventures to succeed in bringing back Han. Following some lip service to the idea immediately after the Empire adaptation and then far too long an absence, this issue kicks off the series' first real sustained effort at turning "the search for Han" into the actual story arc it always should have been. 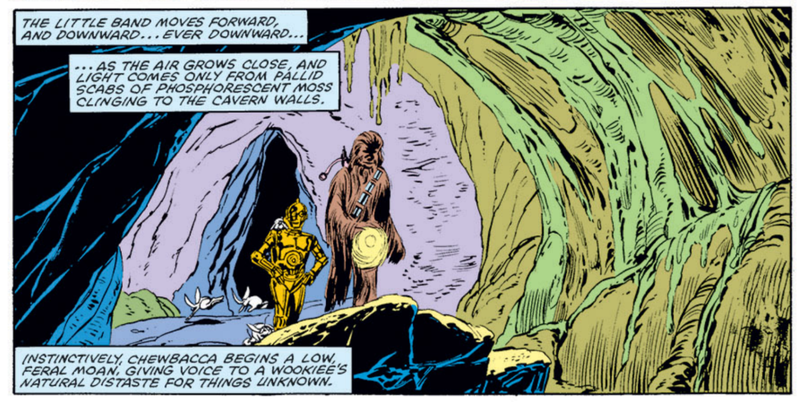 But before the search actually gets underway, it takes what appears to be a narrative detour, pitting Chewbacca & Threepio against an ancient evil in the bowels of the Rebel base. 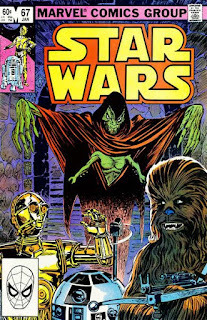 But what this issue does, aside from presenting a pretty fun - and rarely-used - pairing in Chewbacca & Threepio - is re-establish the emotional stakes of Han's absence through that old comic book staple, the emotion-manipulating villain. That Chewbacca has spent any time since Empire not frantically searching for Han stretches credibility; this issue attempts to hang something of a lampshade on that notion by at least acknowledging the depth of Chewie's devotion to Han. It's that devotion that the Darker uses to turn Chewie into a raging beast, and that devotion which Threepio is able to use to snap him back to his senses. Thus, Chewbacca's emotional attachment to Han is shown far more effectively than any bit of narration about how much he misses his friend and partner ever could. The Darker himself is fairly underwhelming (and perhaps a bit too inspired by standard superhero comics for this series) and most of the rest of the trappings of this story are fairly routine, but it's Chewbacca's arc that keeps this from feeling like yet another narrative stall when it comes to Han's fate. Combine that with the Threepio & Chewie pairing (this story wouldn't work nearly as well if, say, Luke was in the catacombs with Chewbacca) and the fact that it presents, for the first and possibly only time, thoughts bubbles for Artoo, and it's a strong return to form for the series. I really like the idea of Threepio having someone, or something, who’s of a similar temperament to converse with in Plif — via extended dialogue, not just Artoo's deets and doots. I’m surprised I don’t have this reaction more often, given how prevalent force fields are in sci-fi action, but it’s only natural when the word “force” is used to have one’s mind turn to the Force even when it has nothing to do with the matter at hand. Maybe there’s a by-law, rule of thumb, or general caution in the Star Wars bible about using the word for just that reason. 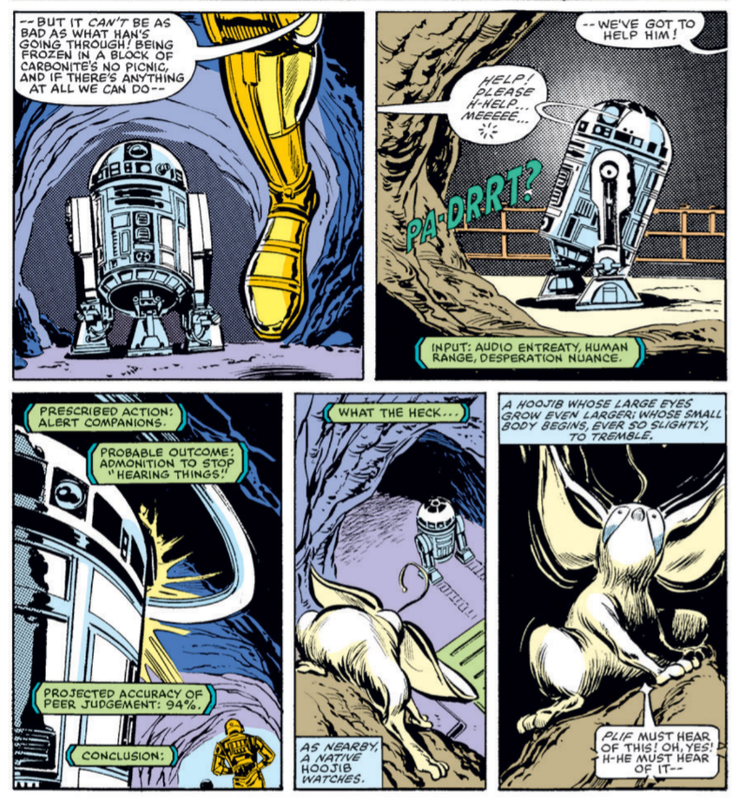 Great minds… To my recollection, I’ve never really mused on the specific notion of droids’ ability to communicate telepathically, but Threepio hearing (or “hearing”) Plif really jumped out at me. Do the Hoojibs perhaps actually manifest audible sound from their own thoughts? It’d be a way to explain this if need be, although there might not be an evolutionary reason for that to be the case since they don’t speak aloud to one another. Or are they really sending unheard telepathic messages that presumably require a brain to receive — and presumably a sentient brain at that, since we tend to think of telepathy as, for lack of a better word, an organic trait? If droids can employ sight and hearing, due to their makers’ ability to replicate the physiological mechanisms by which human[oid]s do, I guess building a telepathic receiver would be possible if one considers telepathy merely another sense to develop, but I don’t know if it’s prevalent enough in this universe or well enough understood for such a receiver to be incorporated into droids’ makeup. So that brings us back to sentience and whether the Star Wars universe (this admittedly wonky corner of the Expanded Star Wars Universe, at least, or Legends now or whatever) is way beyond Star Trek’s in terms of the development of sentient artificial life on a mass scale. None of which, I suspect, Michelinie had in mind when he wrote this. I tend to agree. Much or even most of what we’ve read in this series is more like superhero comics or Star Trek than Star Wars, really, which makes it all the more surprising and appealingly so when we get a story that feels like Star Wars. Understandable since there have been a grand total of two films and six prose novels, including the movie novelizations, to define Star Wars in any meaningful way at this juncture. Plus the Holiday Special, of course.